hi my friends! 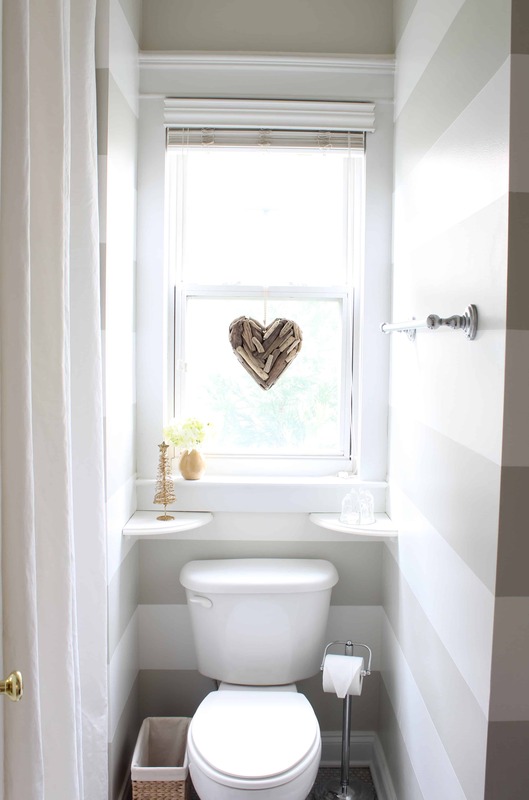 today we welcome the beautiful summer hogan of simple stylings blog, who is going to rock the lakeside cabin bathroom in our virtual showhouse tour. i absolutely love her inspiration room and picks for the room. one cool thing about summer is that she claims she's not creative (the jury is still out), but her projects always end up beautiful anyway. she's able to make good design approachable, attainable and 'simple' for everyone, and she is showing you her secret formula in today's space. and this is a space that needs a LOT of help. just look at this tiny and sad bathroom! shudder! summer, we need you to remix this room asap! Hello Avery Street Design readers! I'm Summer from Simple Stylings and I'm so happy to be here with you guys to share my contribution to the lake cabin virtual makeover. Not too long ago I 'met' Laura on Instagram and immediately knew we had a design connection and it turns out she is as sweet as her IG feed. Wouldn't y'all agree! Laura recently came across pictures of a lake cabin in Ohio that she vacationed at every year as a kid. Nostalgia kicked in and like most of us design freaks she instantly started updating the cabin in her head. That's when she had the idea of having a team of bloggers put together design inspirations for each room in the cabin. You can actually view the pictures of the cabin here. When she asked me to participate in this unique post idea I was honored but also a little taken aback. I've never written a post quite like this so I wasn't sure how it would unfold. But I'm always up for a good challenge so I couldn't wait to get started! 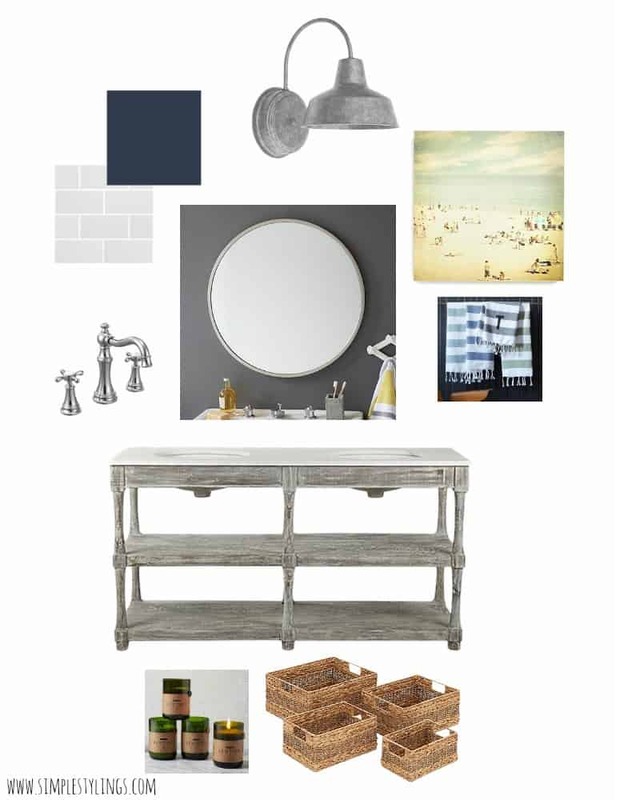 I chose to take on the bathroom in the home because I love decorating bathrooms but rarely get a chance to create a design board for one. I searched the web and Pinterest as I always do and came across this image and knew it would be my inspiration. I wanted to stay true to my coastal roots but I also wanted the room to have a rustic feel that would fit right in the lake cabin. I love the crisp white subway tile against the navy walls. 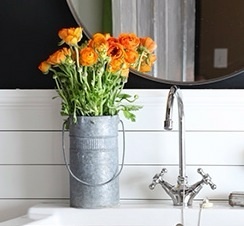 The rustic vanity and galvanized metal add the perfect touches. It's a little bit rustic, a little bit vintage. Cozy yet polished. What do you think? Can you picture this bathroom in a cabin on a lake in the woods? Sign me up! You can find the sources or similar sources by clicking on the links below. 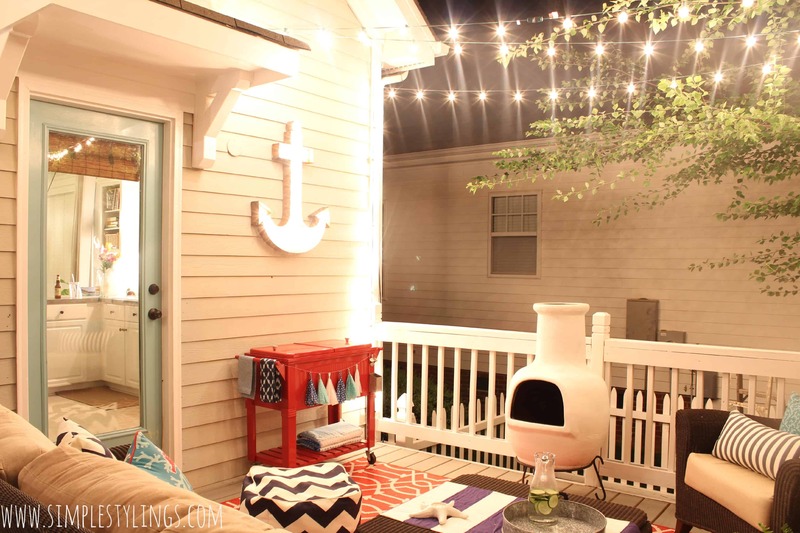 I'd love for you guys to head over to the blog sometime and check out a few of my projects. This is my nautical inspired bathroom and deck. Thanks again for having me Laura and I hope you all have a wonderful rest of your week! thank you so much summer! this bathroom is going in my inspiration folder for my powder room immediately. i've been swayed away from the ornate mirrors lately and i love the simple round one you've got going on here. well, one day and one room left. come back tomorrow when grace returns with a beautiful bedroom makeover! Thanks so much for having me Laura! This has been such a fun project!! thank YOU summer! it's been so fun!! Love that bathroom! Coastal chic.